7 Next Moshe summoned Y’hoshua and, in the sight of all Isra’el, said to him, “Be strong, be bold, for you are going with this people into the land ADONAI swore to their ancestors he would give them. You will be the one causing them to inherit it. Deuteronomy locates Moses and the Israelites in the territory of Moab in the area where the Jordan flows into the Dead Sea (1:5). As his final act at this important time of transferring leadership to Joshua, Moses delivered his farewell addresses to prepare the people for their entrance into Canaan. In them, Moses emphasized the laws that were especially needed at such a time, and he presented them in a way appropriate to the situation. In contrast to the matter-of-fact narratives of Leviticus and Numbers, here the words of Moses come to us from his heart as this servant of the Lord presses God’s claims on his people Israel. The trajectory of the story that unfolds in Genesis-Numbers seems to call for an account of the conquest of Canaan as found in Joshua to bring closure to the movement from promise to fulfillment (see Introduction to Joshua: Title and Theme). But Deuteronomy intervenes as a massive interruption. Here there is very little forward movement. At the end of Numbers, Israel is “on the plains of Moab by the Jordan across from Jericho” (Nu 36:33) and at the end of Deuteronomy, the people are still there (Dt 34:8) waiting to cross the Jordan (see Jos 1:2). All that has happened is the transition from the ministry of Moses as God’s spokesman and official representative to that of Joshua in his place (Dt 34:9; see Jos 1:1-2). But Moses’ final acts as the Lord’s appointed servant for dealing with Israel are so momentous that Deuteronomy’s account of them marks the conclusion to the Pentateuch, while the book of Joshua, which narrates the initial fulfillment of the promises made to the patriarchs and the conclusion to the mission on which Moses had been sent (see Nu 17:15-23; Jos 21:43-45), serves as the introduction to the Former Prophets. of deliverance from a life of banishment from God’s Garden (Ge 3) to a life in the Lord’s own land where he has pitched his tent (Jos 22:19). But in that long pause on the threshold of the promised land Moses, in this renewal of the Sinaitic covenant, reminded Israel at length of what the Lord required of them as his people if they were to cross the Jordan, take possession of the promised land and there enjoy the promised “rest” in fellowship with him. It was a word that Israel needed to hear over and over again. Upon reading the Pentateuch, Israel was brought ever anew to the threshold of the promised land and its promised “rest” to hear again this final word from God through his servant Moses (see also Ps 95:7b-22). For this reason, all the history of Israel in Canaan as narrated in the Former Prophets is brought under the judgment of this word. The book of Deuteronomy was cast in the form of ancient Near Eastern suzerainty-vassal treaties of the second millennium b.c. It contained the Great King’s pledge to be Israel’s Suzerain and Protector if they would be faithful to him as their covenant Lord and obedient to the covenant stipulations as the vassal people of his kingdom. There would be blessings for such obedience, but curses for disobedience (chs. 27 – 30). Deuteronomy’s purpose was to prepare the new generation of the Lord’s chosen people to be his kingdom representatives in the land he had unconditionally promised them in the Abrahamic covenant (see Structure and Outline below; see also notes on 3:27; 17:14,18). The love relationship of the Lord to his people, and that of the people to the Lord as their sovereign God, pervade the whole book. Deuteronomy’s spiritual emphasis and its call to total commitment to the Lord in worship and obedience inspired references to its message throughout the rest of Scripture. In particular, the division of the Hebrew Bible called the Former Prophets (Joshua, Judges, Samuel, Kings) is thoroughly imbued with the style, themes and motifs of Deuteronomy. Among the Latter Prophets, Jeremiah also reflects strong influence from this book. D.V. Karen and Kathleen will always be remembered! Have to remember my sisters, Kathleen McClarren and her identical twin, Eve Karen Francesca McClarren Scott (01-31-1996). Life here on Earth, just too short – also, to remember both of you – had Masses said at St.Francis Assisi on Telegraph road. Have to believe that you are both with the Angels and Saints, spending time with our Almighty Yahweh! Will have to post the pictures of you and Tom when we went bowling, and when we went ice-skating I think Tom was home on military leave at the time? It’s good to take pictures to help remember all the good fun times – so long ago? Also… was looking at that “notebook” that you used to write all of your stories, and, so now “Alyssa” – my Grand-daughter will have to do all the art work for your stories, and help me to get that published for you. “Alyssa” can work wonders illustrating all of your stories, and with all of your original work, like your book – it is just what the “writer’s market” are wanting today! So, Karen, and Kathleen, just so you know – neither one of you will ever be forgotten! Everyone and all those, who have ever met you and even everyone I tell about you – always ask for more information – since you have a real story that needs to be told! I can only say … “you” – both may be absent from the body, but – I do know… you are both in the presence of the Almighty our Creator. May, HIS Blessings, be with you both, forever more! D.V. “This is what babies look like, when they are entertaining “Angels” in their dreams – since, they still have connections – for just a short span of TIME – still getting last minute information on what their plans are to help make their new EARTH FAMILY – as HAPPY as they can be – since our new born babies know, that they have a very special mission here – and just may need some reminders, so in their “Sleep Time” – before all connections with HEAVEN are cut off – just have to soak up – all those extra special orders, from “Headquarters” that special planning place where all of our Heavenly requests are received – to be fill – for the correct TIME of sharing LOVE on EARTH!” D.V. 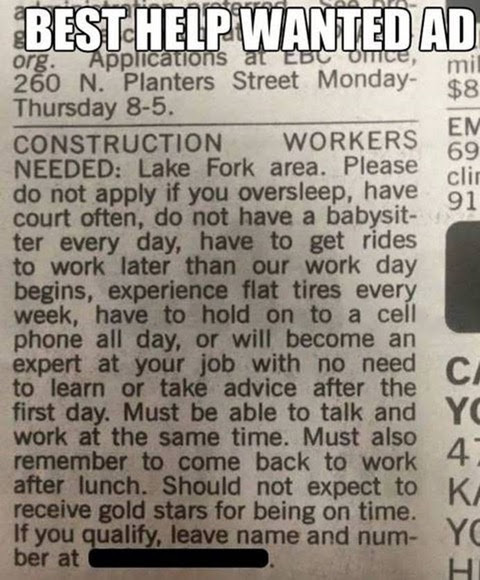 Nothing like receiving an advertisement for work – by a Company – that spells out exactly – what they are looking for – and spells out for the readers – some of the very poor excuses that, they have received from people that were hired – but, for one or more of the poor excuses that you can read in the newspaper ad, below – just could not show up for WORK! There is noting like a TRUE story… When you apply for WORK – you will find that some Companies will be testing you to see exactly what you can do. So naturally for the Post Office and this is besides the written tests and physical and all of the other tests – YOU will be expected to pick up a 100 pound sack of mail from this chair – and deliver the same sack, to a distant chair, at least one hundred feet away. For the average man – no problem, they can pick up “100# sack of mail” one after the other, but now – for the average woman, maybe one or two – depending on – if the sack is full and if they can drag it here and there – but for this test – you must only carry it – this one time across the room. So this nice cute woman was hired and when she arrived in an area where these large sacks of mail were – one sack was just too heavy for her to move – so, some nice “MAN” came over and did offer to her, that he would be happy to HELP her – to move these HEAVY sacks, for her, and they “kinda hit it off” as “friends” while working. There are times when your work schedule calls for you to work two weeks straight and then get four or five days off straight – and remember the “PAY” if very good! Just so happens, that these two, were working together and seem to be very friendly at work – and every time a much “too” heavy sack was in her work area – she would call for, her “good friend” – and he was “Johnny on the spot” to help her. No one knows for sure what and or if, they have had any after WORK time together – but – it would seem that – there will come a day, just for paying for favors received – especially when, you are both being paid, the exact top dollar, for the same kind of WORK! So, NOW – the day came – She had called, for her “helper” to help her – and he went over with smiles, fast and furious – he grabbed her shirt and her slacks and pulled them down to the floor covering her shoes – just left her, standing there, in just her under clothes – he walked away with even bigger smiles on his face! That was his “PAY DAY” – since she did not reciprocate to “his needs” – some where along those lines, is what everybody was left to give some serious thought, about! – On the 29th of January 1996 – makes twenty-three years since my sister, Karen died. This was just two weeks before her 50th Birthday and almost 35 years married to her husband, Jim Scott. When one says that LIFE is too short – must have also experienced this same thing as someone in the family having everything going for them – wonderful family and home and taking vacations to Hawaii – no fear of very long distance flying – and health that was very good. One wonders what really happened? 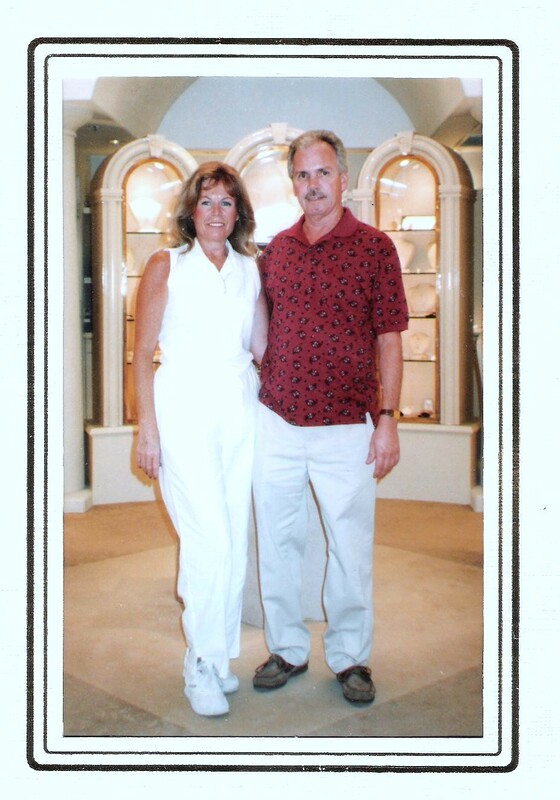 As you can see in the above picture of Karen and her husband, Jim – they are very “HAPPY” and having a very good time in “Hawaii!” – ” I only wish that my sister, Karen could have lived just a little longer?” D.V. “Karen” had an identical twin – her name was “Kathleen” and she just lived a very short time – after being born – so we do know, that she is in HEAVEN! “If only I could crochet – that fast – and get something wonderful made – Pronto!” D.V.